This is one of my favorite recipes but sometimes it takes a lot of time to actually make it, that is why I have a "long" version of the recipe and a " short" version of the same :-). You can chose form either, they are prety much the same in taste. Mix the softened butter with the sugar, until smooth. Add the cinnamon, cocoa and pistachios together and stir until well blended. After you spread the cream on top of the dough, roll it and cut 1.5 inch thick circles from it. Spray a non-stick spray on a square sheet pan. Place the dough circles in the pan and leave it to rise about 30min in it. After the dough had raised, brush with the egg white on top and place the pan in a warm oven ( around 190F), bake for 10 min and then switch the temperature to 350F. Bake another 25 minutes or until golden brown on top. After you take the sugar "snails" out of the oven, let them completely cool down and then pour the warm ( not hot!) syrup on top( recipe below). Combine the ingredients in a pan and boil until the quantity is reduced in half. Leave the syrup to cool down and then use as directed above. 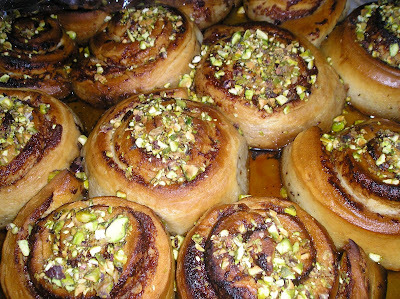 After you pour the syrup over the dough snails, leave them like that overnight. Next morning take each of the "snails" out, place in a plate and sprinkle chopped pistachio on top. Serve cold. If you don't have time to knead a dough, just buy a puff pastry dough, spread the cream and roll. Cut into circles and then place on parchment paper and bake at 350 F for 20 min. Leave to cool down completely, remove them in a pan without the parchment paper and then pour the warm syrup on top. Leave overnight, then serve cold with chopped pistachios on top.